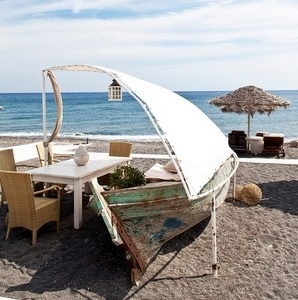 In the cosmopolitan beach of Perivolos, Seaside by Notos creates the perfect summer backdrop. If you are after gourmet seafood cuisine, this is your ideal choice. It’s just fascinating how Seaside by Notos manages to finely balance its modern, cosmopolitan nature with an unpretentious gourmet atmosphere, being relaxed yet boasting excellent, informal service. An atmospheric seaside haven, playing with the shades of white and sand. It all starts on the beach, with its comfortable sun beds, fluffy towels, and straw umbrellas that lend it an exotic touch. With fresh fruit juices, sandwiches, cocktails and even tempting dishes, the beach service you will enjoy here is exemplary. Stretch out and indulge in your book, while your champagne bowl keeps your water, wine or even champagne nice and cool. Further up, you’ll find the restaurant and bar. The chef’s creative cuisine will take you on a journey to the four corners of the earth, through Mediterranean flavours with a twist. For a truly unique experience, have a meal at the table-boat on the beach, listening to ethnic and lounge music, which changes pace depending on the time and the crowd. A real journey of the senses, against a backdrop of volcanic sand and the blue sea. And, of course friendly, warm, unpretentious service, a unique atmosphere, quality and distinct flavours.